What is being on the Caldecott committee like? 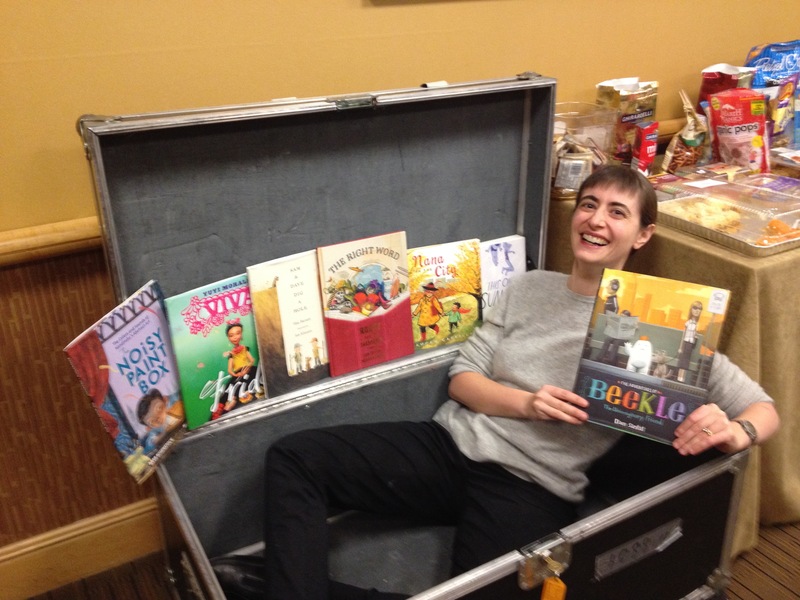 The Caldecott nominations arrived in our meeting room in an enormous steamer trunk. After the winner and honors were selected, I got into the empty trunk, and everyone handed me the books. And then everyone else got in the trunk after me, one at a time, and took a similar picture. I love the expression on my face here… minutes after the final decision. Another noteworthy comment about this picture is that the food behind me- or Caldesnacks- were local specialties from all over the country brought by committee members. -An interview I did about being on the committee. -All the rooms where the Caldecott happens. -Why I stopped making award predictions. -How each book award committee is different. -What I want you to read if you didn’t get a phone call on announcement day -moral support and some reasons your phone might not have rung. -What it is like to be at the press conference. -What those calls to the winners are actually like. -What I learned in the year after the Caldecott committee. If you have more questions, I have more answers. Send me an email. You were on the Beekle committee?! Did you get a tattoo? To my total surprise, this has been the number one question asked by people in the children’s book industry. So, here’s what happened. The editor and author of the book had a bet. If Beekle won the Caldecott Medal, not an honor, they would both get tattoos. Totally separate from that, several members on our committee also decided to get tattoos. All of this was chronicled in a School Library Journal article, which is why everyone seems to know about it. Amazingly, more and more book award committeesnow seem to be getting tattoos. And the answer is no. Why all the secrecy? Did the book you voted for win? If you haven’t been on the committee, I know the extreme secrecy seems crazy, but it’s actually there to protect the committee. It allows committee members to say absolutely anything they want about the books under discussion without concern that it will get back to the creators. The basic rule is that you can discuss your opinion but not the committee’s opinion. So, you can speak for yourself but not the group. And I can’t tell you what I voted for. Or how many books were on the ballot. Or how many votes there were. Or what was nominated. Or why a book won or lost. Never ever, even if you ask nicely. Here’s some of my thoughts on the confidentiality if you want to know more. Wait, you were on the Caldecott committee that picked six honors? And the first graphic novel EVER? And a Young Adult book? Why did you do all that? AND WHy didn’t you include that book i love? Why, why, why? See above about the secrecy for life thing. That applies to these questions, which I get asked a lot. Sorry! And see below about the fact that everything we did was according to the criteria and manual. But I will say that I was terrified just before all of that was announced- how was everyone going to react? And that huge gasp at the press conference after the words “the Caldecott committee has selected six honors?” I won’t ever forget that. I read every one of these books and took careful notes. I read some of these more times that I can count. Whenever I see a 2014 picture book in a library or bookstore, it always feels like an old friend. Something crazy happened at the awards. A picture book won the Newbery, etc. Are you surprised? No. I generally find the people who are surprised, shocked or dismayed are just not that familiar with the actual rules. I’ve never seen something happen that went against either the criteria or manual. How many books were submitted the year you were on the Caldecott committee? Seven. So that made picking one winner and six honors super easy. No, actually it was hundreds. 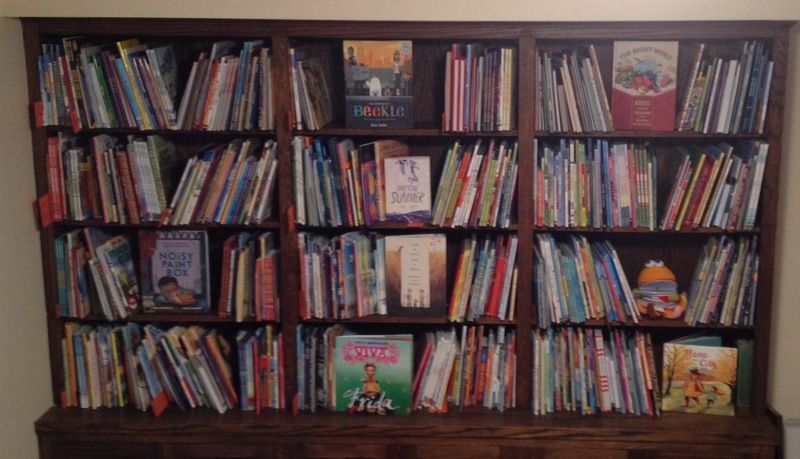 Take a look at the picture of my bookshelves to see what they looked like at the end. If I know too much about the Caldecott or Newbery, it means I’ll jinx my chances of getting them. Shouldn’t you stop talking about it or at least turn around three times and throw salt over your shoulder? I think information and transparency is good. Just like every baseball player knows what it takes to win the World Series, I think every children’s book creator should know what it takes to win the Caldecott and Newbery. I don’t think it’s a bad thing to know the rules of the committees and how they work. It makes the results more understandable. Otherwise, it’s this vague impossible thing. It’s still an impossible feat, just based on the sheer number of submissions, but wouldn’t it be nice if it wasn’t vague? It’s not something you can control but it is something you can learn more about. How do I spell thE award given to the most distinguished contribution to American literature for children? Newbery. Newbery. Newbery. NOT NewBERRY. It is named after John Newbery and his last name only has one R. Nobody asks this, but I wish they would. I’ve written a picture book. What do I do next? Join the Society of Children’s Book Writers and Illustrators (SCBWI). They can help with everything you need to know. Go to their conferences- they have both regional and national ones. Also, join a critique group if you can. Do your research before submitting to anyone to be sure they are the right publisher or agent for you. Even after you find someone you want to submit to, don’t press the send button until your story is in the best shape you can get it in. And you don’t need to find an illustrator. The editor does that. 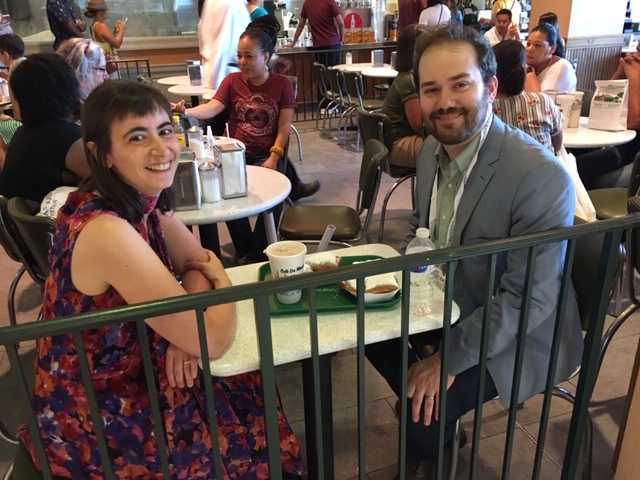 This is totally not a picture of Sean Rubin (who is illustrating my book) and me sitting down and talking over beignets in New Orleans. Your eyes are deceiving you. You should get them checked. The author and illustrator sit down and Talk when they are working on a picture book together, don’t they? No. Actually the author and illustrator rarely even meet each other. Everything goes through the editor. From everything. From a song, article, conversation, thought- it could be anything. In the case of The Passover Guest, it is an adaptation of one of my favorite books from when I was younger. Plus, Passover is my favorite holiday, so that helps. The answer I hear so many people say is that they write every day in a special, wonderful writing place. And I’d like that to be my answer. But I’ll level with you. I have more than one job and more than one kid and that writing utopia just isn’t possible for me. I write as much as I can, where I can, when I can. You get a Master’s Degree in Library Science. I highly recommend a school accredited by the American Library Association, of which there are approximately 60. It is typically about a two year degree and there are now a lot of online options. There are also many jobs in libraries that do not require the degree. 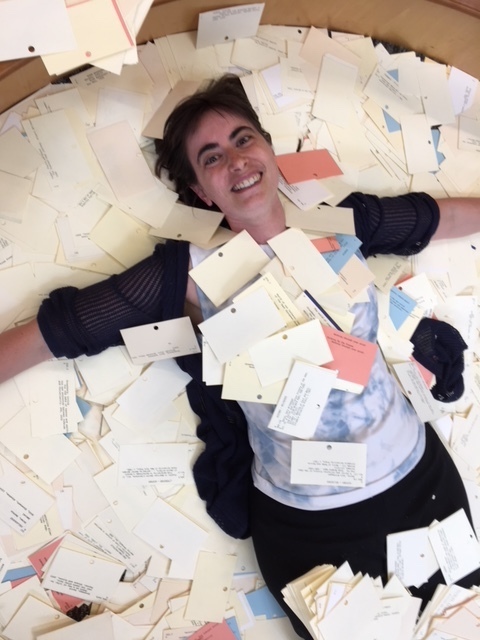 When my library moved from a card catalog to a computer catalog, I said a fond farewell to the card catalog cards. This picture was so much fun to take because card catalog cards have to be kept in exact order. It was incredibly freeing not to need them anymore and be able to toss them in the air. I’m a new librarian. What next? Mazel tov! Welcome! It’s a wonderful career. My advice is to get as involved in the profession as you can. Attend conferences, both local and national. Don’t be afraid of the American Library Association. It’s really not that overwhelming once you get to know it. Be on committees. Read professional journals. Ask questions. Find a mentor. Jump in! You’re a Librarian? It must be nice to read all day at work. You’re right. That would be nice. Except it’s not what librarians do. Librarians are professional researchers. We know how to find information. We do read, but on our own time and not during work. Also, libraries are not necessarily quiet places, I don’t have a bun or sensible shoes, and I’ve never shushed anyone. How is being a synagogue librarian different than being a public librarian? The main difference is being a solo librarian and having a job that includes everything in the library from cataloging to shelving to customer service. Also, you get to know your patrons much better. Here’s a day-in-the life of my library interview I did a few years back that should give you an idea. How Does a Bookstore Buyer Buy Books? And will you buy Mine? A bookstore buyer will buy as many books as a bookstore buyer can. Buyers buy directly through publishers and distributors. If you are with a mainstream publisher, I will see your book automatically through publisher sales reps. Don’t worry. Please do not send me self-published books. I’m sure they are wonderful, but I have thousands of other books to go through. I wrote the best book ever but when I walked into a bookstore, it wasn’t there. Why? So many reasons. And please don’t take any of these personally. Maybe they passed on it, overlooked or they didn’t place an order with your publisher for that season. Or they are a small store and could only afford a few books they were sure would be bestsellers. Or they had it and sold out and the reorder hasn’t come in yet. Or they didn’t think it would be a good fit for their store. Or it was in stock, but no one bought it so they returned it. Or it’s an old book and they only have room for new ones. Or it’s somewhere in the store but it’s misplaced and no one can find it. Or, or, or…. Independent bookstores are failing, right? Wrong. Indies are actually doing great and have been on the rebound in the last few years. While a few a still closing, a lot more brand new stores are opening. 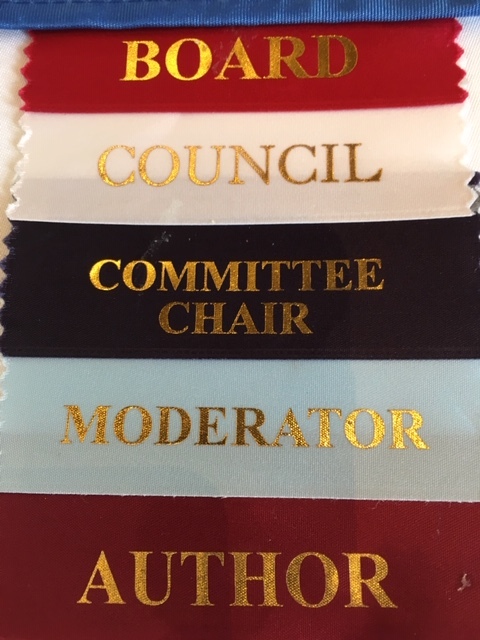 My badge from an Association of Jewish Libraries conference that shows a few of the things I do. You seem to wear a lot of hats. What is your main focus? Books. I love books and every job I do is involved with them in some way whether as a writer, a researcher, a librarian, a bookseller, a committee or board member. I’m always interested in finding, making and advocating for wonderful books for children. You never recognize me when we see each other. Why not? I don’t recognize people’s faces. At all. I could meet you at 7 am, and then again at 8 am, and I wouldn’t remember what you looked like. This is one of those it’s not you, it’s me things. Keep introducing yourself to me and let me know your name and how we know each other, every time. I’ll get there after 5-10 more times. I hear you’ve memorized All SEVEN Harry Potter books. Seriously? How did that happen? This is something I never intended to do and which I explain in this totally embarrassingHorn Book post. The incredible part is that I notice something new every time I read them. Yes, I will still be friends with you, even if Harry Potter is not your thing. Also, I’m amazing at Harry Potter trivia. Tell me something about yourself that has nothing to do with books. Oooh, a challenging question. I love Broadway musicals and my first career was in theater management. I do triathlons (the short, sprint ones, not the Ironman.) Long distance bike riding is one of my favorite things. I have a wonderful husband, great kids and a cute dog. Newbery. One R. Learn it. Use it. All the cool kids are doing it.